Back in Santa Fe the Indian and Ethnographic craziness continues. 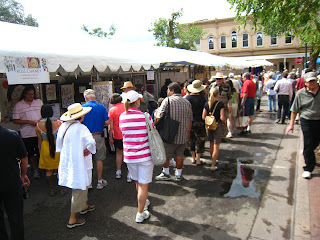 We came back from Hopi in time for two different Ethnographic fairs and what we call Old Indian Market. 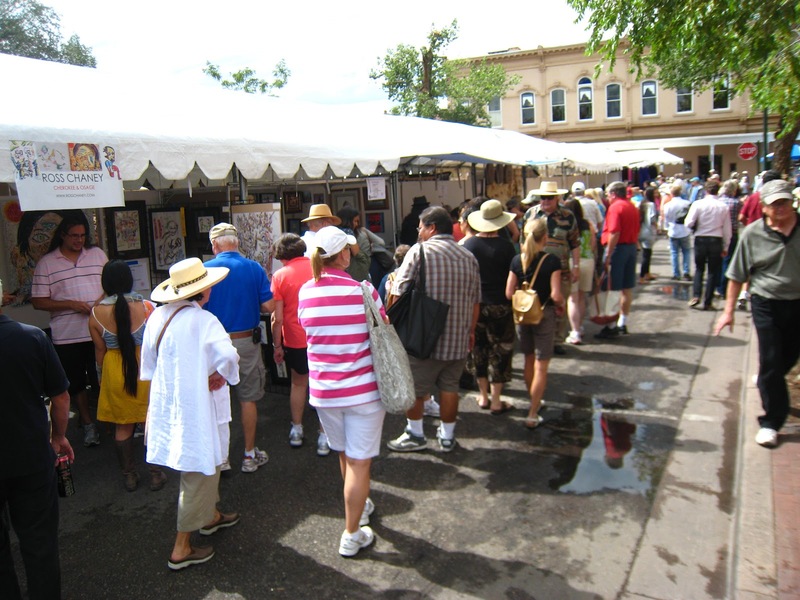 The latter takes place a few days before the big Indian Market at the Santa Fe Community Convention Center. Dealers from all over come to the Whitehawk Fair to show historical material from many tribes. We, of course, go from booth to booth, as everyone does in a fair, chatting with friends and colleagues along the way. Is this one better or less good than the similar object in the other booth or do we have one already that is more satisfactory? Does this object advance our collection or just add another similar piece to it? Needless to say, Penelope and I often disagree so we then discuss the reasons we feel the way we do. Inside secret: watch a dealer’s face when you say I need to speak to my significant other about it. No matter how hard the dealer tries to cover it up you will see a fleeting grimace on his face and can imagine his groaning inside! As far as Penelope and I are concerned, we have pretty much split our collection into what each of us collects with overlapping fields as well. In the other’s area we rarely use our available veto, but, after all, the other has to live with the object as well. Much more often we agree or one of us has our eyes opened by what the other has said or the information that we learned from the dealer. 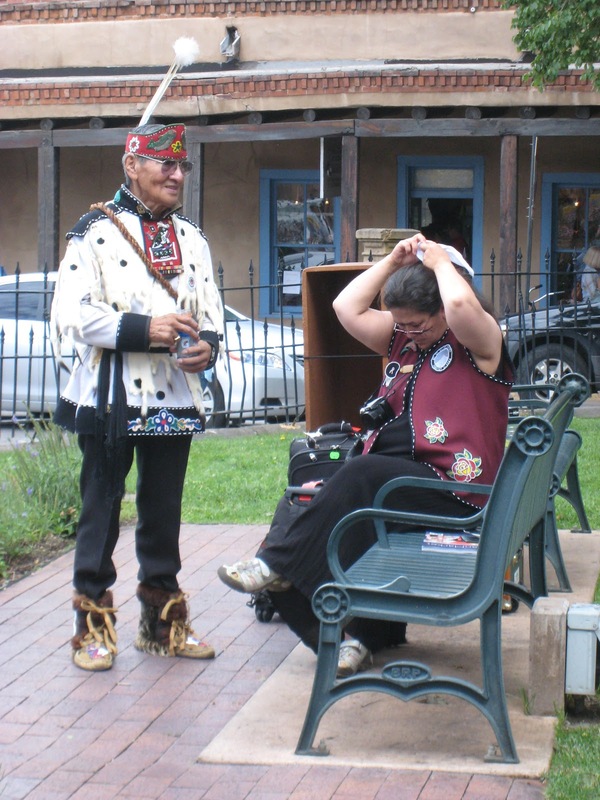 Last week-end was the main event on our collecting calendar, Indian Market, with nearly one thousand Native American artists on the Plaza and the streets surrounding it. The “Sneak Preview” takes place in the Convention Center the evening before Market begins. The works submitted for prizes are shown with their ribbons, if they have won, along side them. The reason I have no illustration is that as we were standing in line to get in, a security person walked up and down the line saying, “if you even take out a cell phone or camera inside you will be escorted out of the show.” Reason given, “copyright issues”. The next morning, however, at 7am the booths on the streets open for business and everyone is out with their cameras… go figure. As I have probably said before the Indians often keep their best pieces for the market because they want to submit them for the prize ribbons. So often, but not always, there are stellar works that one sees at the preview that collectors covet. If the artist is well known or the work is extraordinary (and they often go together) there will be many who desire the piece. The rule is that the Indians cannot sell and the collectors cannot buy until exactly 7 am the morning after “Sneak Preview” and, to my knowledge, no one cheats. What the collectors do, however, is come early. In fact, in one case this year someone stayed on the plaza all night in the pouring rain to be the first in line at a specific booth. He wanted to buy the basket that had won the top prize known as “Best In Show”. It was by Jeremy Frey of the Passamaquoddy tribe in Maine. And yes, we found a piece we couldn’t leave behind: a silver concho belt by Ed Kabotie, grand-son of Fred Kabotie, who was responsible for the post-WWII renaissance in Hopi art and son of Michael Kabotie, silversmith painter and sculptor. If you have the bug, there is no stopping the passionate collector.